Most of the preparation (barely any at that) for this bowl starts overnight. In a mason jar or whatever other kind of jar you have, combine oats, milk, yogurt, matcha, water, and chia seeds. Cap the jar and shake, shake, shake; then leave in the refrigerator over the night. The oats and chia seeds will soak up some of the liquid, and the chia seeds will slightly expand, creating a thicker, pudding-like texture. 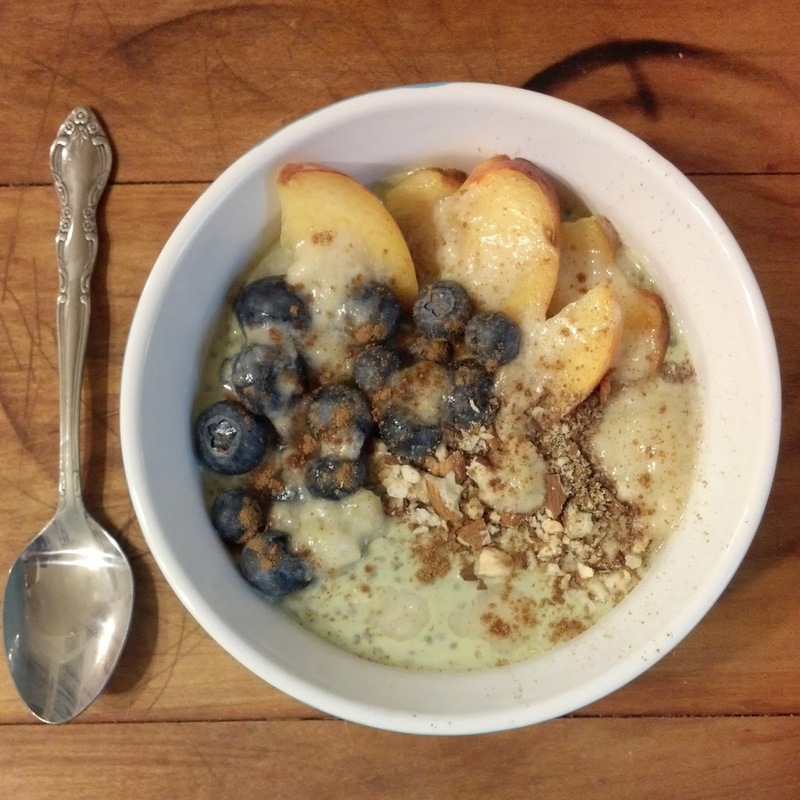 In the morning, simply pour the matcha oat pudding into a bowl. Top the bowl with peaches, blueberries, flax seed, and almonds. In a small bowl, mash the banana slices with 1 tbsp. almond milk and mix until liquidy. Drizzle the banana "syrup" over the filled bowl. This will add a little sweetness (if you want to use a sweetener, go ahead and mix it in the mason jar overnight with the other ingredients - I don't like my breakfasts super sweet so I didn't feel the need to add any). Top with a little cinnamon and you are good to go!